Eindhoven, Netherlands – Philips is entering a new segment with the introduction of three robust, high-performance LED inspection lamps: a penlight, a LED inspection lamp on 240 V or 24 V, and a LED inspection lamp with docking station. These lamps provide high light output to illuminate confined dark spaces, for instance when servicing a motor vehicle engine. This enhances professionals’ and consumers’ ability to concentrate, work more precisely in a relaxed manner. Lighting is often an under-addressed element of the workplace. A light level of at least 300 lux is the legal requirement for most workplaces. In principle, the brighter the light, the more the color temperature of the light should resemble natural daylight, so that it is perceived as pleasant. The inspection lamps’ various features and easy handling mean they can be used in many different situations – by professional mechanics, DIY enthusiasts or paramedics, to name just a few. The compact, cable-free penlight is particularly user-friendly. Six high-powered LEDs provide a bluish light with an intensity of 120 lux. The LED pointer on the pen tip illuminates the working area precisely with 85 lux. The penlight can be used for up to eleven hours at a stretch with its three Philips AAA batteries and is water & dust-protected (classified IP54). This inspection lamp bathes the surrounding area in a very bright white light with an intensity of 2400 lux. The 45 high-powered LEDs are arranged in such a way that they illuminate evenly with an angle of 180 degrees. The lamp’s slim design and 10 meter cable mean that even difficult-to-access areas can be reached easily. The adjustable mounting hook is also extremely practical, with both hands being kept free for working. A version is also available with a 24 V industrial plug to meet the workplace safety requirements in certain European countries. 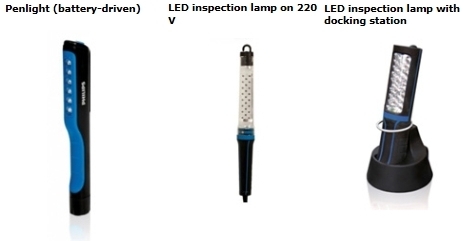 The LED inspection lamp is water & dust- protected and also offers strong impact resistance (classified IP66 and IK09). The inspection lamp with docking station is designed in such a way that it can be aligned in various positions while retaining maximum stability. Its flexible multi-angle hook can be pulled inwards and outwards, and the lamp can also be attached magnetically. Fifteen LEDs, focused on the working area, generate a bright light with an intensity of 1200 lux. There is also an additional blue light which makes it possible to trace leaks in air-conditioning systems. The lamp is IP54 / IK09 classified and can be used for six hours at a stretch before it has to be recharged with the charging station that can be connected to the 220 V power supply or with the 12-24 V car adaptor. All Philips inspection lamps are also protected against chemicals thanks to their robust casing. The durable, high-performance Philips LEDs make these lamps extremely reliable, thereby avoiding maintenance costs.